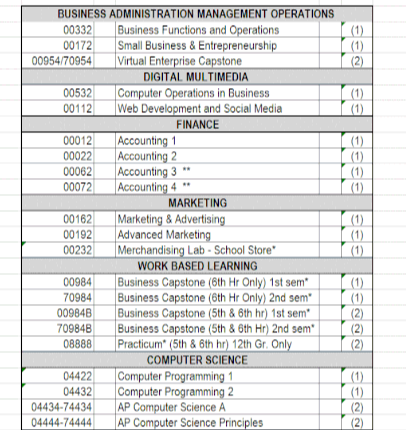 Below are all our classes in 5 separate Business and Technology Programs that we offer. For further information about each class please open the Course Description Handbook that is attached below. "The Business Professional of America club is cool." "The business classes at RHS are a true introduction to the business world." "Business Functions and Operations is a very unique class that everyone should take." "I Like when the business teachers tell you about their personal lives and they make you feel like you're part of the family." "I really enjoyed BPA while I was here." "The projects that we do in Marketing are really enjoyable." "The advisers from Rochester ran the Regional Competition in a very professional manor." "The staff at RHS has provide me with countless opportunities to explore my untapped potential in business. Which I will explore further in my business and political science degree."